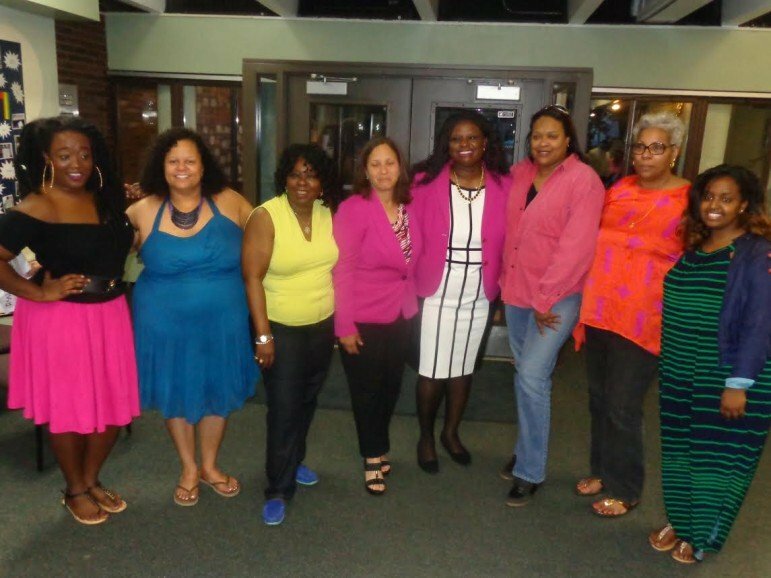 Minneapolis NAACP officials (l-r) Ashley Oliver, Kerry Jo Felder, Helen Bassett, Cathy Jones, Nekima Levy Pounds, Natonia Johnson, Shirlynn LaChappelle and Wintana Melekin. The Minnesota Women’s Press published a feature profiling the ways the new women leading Minneapolis’ NAACP chapter are taking a fresh approach that combines activism and policy-making. Revitalizing a venerable organization takes bulldog determination, says Nekima Levy-Pounds, the new president of the Minneapolis NAACP. That’s exactly the quality the organization’s first all- female elected board of directors has in abundance. In a special election in May – held because the Minneapolis branch had gone virtually dormant – NAACP members elected Levy-Pounds, first vice president Natonia Johnson, second vice president Cathy Jones, treasurer Helen Bassett, secretary Kerry Jo Felder, assistant treasurer Ashley Oliver and assistant secretary Bertha Daniels. The women didn’t run together as a slate. Members simply had an excellent group of candidates to choose from and they happened to be women, says Levy-Pounds. Read more about how the NAACP chapter is moving forward here. The Minnesota Spokesman-Recorder reported on Monday that the protests following the shooting of Jamar Clark at the Fourth Precinct in North Minneapolis may wind down on Tuesday, although the status is unclear after the shooting of five protestors by white supremacists on Monday night. The news came after a closed door meeting with community organizers on Sunday, Nov. 23. “The main focus of the discussion was the next steps,” explained Adja Gildersleve of Sunday’s meeting, which included talk on how to end the occupation “in a way and not let the energy dissipate…end it in a way we want to end it. See a list of ongoing community events to support Black Lives Matter and Jamar Clark on MSR’s website. Communities across the world honored Transgender Day of Remembrance on Nov. 20. At least 81 transgender people were murdered worldwide in 2015, and those are only the names that have been reported. Twenty-one Americans have been killed in the epidemic of violence that has disproportionately targeted transgender women of color. The Column noted the many different ways Minnesota residents celebrated the lives of transgender neighbors. Read more at The Column. Minneapolis and St. Paul NAACP chapters unite to target state’s racial wealth gap The myriad racial disparities and issues affecting Black Communities in the Twin Cities have caught the attention of the National NAACP, which has announced that it will create an Economic Inclusion Plan (EIP) for the Twin Cities. “Truly I tell you, whatever you did for one of the least of these brothers and sisters of mine, you did for me.” – Matthew 25:40We are a nation divided.Nothing illustrates that more than the cascading protests, rallies, and ardent cries for justice in the aftermath of the "not guilty" verdict in the George Zimmerman trial. Those outcries and the concurrent spirit of indifference on the part of many privileged Americans tell us all we need to know about how far we still have to go before we see each other the way God would expect.Indeed, the murder of Trayvon Martin, an unarmed teenager, painfully reminds African Americans as a community that in spite of possessing the unsurpassable worth granted by Christ, black life is without value to the broader society.While many of us expected to hear words of comfort, hope, and a renewed call for love and justice in our respective houses of worship, instead most of us encountered a resounding immoral silence.